How much do Twins suites cost? Prices typically range from $2,900-$6,000 for Minnesota Twins suites. Prices vary based on day of game, opponent, and the location of the suite. Suites at Target Field can accommodate groups 16-30 people. Luxury suite prices for concerts and other events at Target Field can vary widely based on the type of event. Target Field Skyline Suites are located along the 3rd baseline and is the perfect suite option for larger groups. Skyline suites can hold 50 - 150 guests. Premium in-suite catering options and amazing views of the city will fans on their feet enjoying Twins baseball in VIP style. Premier suites at Target Field accommodate groups of 16 people. This Twins suite is ideal for smaller groups. A Twins suite will feature HDTV, interior entertainment area, premium seating, in-suite catering options and a suite attendant. Event suites at Target Field accommodate groups of 24-36 people. This Twins suite is ideal for larger groups. A Twins suite will feature HDTV, interior entertainment area, premium seating, in-suite catering options and a suite attendant. The 2019 Minnesota Twins are ready to take over the American League Central. Target Field is home for the Twins and fans headed to the park will get to see their favorite Twins’ players wearing new uniforms this season! Target Field offers fans breath taking views of the city and it’s hard to imagine, it’s already the tenth season. The 2019 plan is to get back in the postseason and to get there, the Twins have hired Rocco Baldelli as their manager. The additions didn’t stop there, during the offseason, the Twins added some firepower in slugger, Nelson Cruz. Twins fans will get to see one of league’s best home run hitters, as the 38-year-old All-Star is showing no signs of slowing down. The second big splash was the signing of former Astros player, Marwin Gonzalez. Also, new to the Twins infield will be Jonathan Shoop and first baseman, C.J. Cron. However, one player Twins fans won’t see this season is Joe Mauer. Mauer has retired as one of the greatest Twins players of all time. Back in the mix, outfielder, Eddie Rosario, has quietly become one of the baseball’s best all-around batters. The Twins are hopeful that their young core players such as Byron Buxton, Miguel Sano and Max Kepler get back on track in 2019. Don’t sleep on the Twins’ pitching staff. Jose Berrios is one of baseball’s future stars. Jake Odorizzi will look to turn things around this season while the Twins also get back Michael Pineda from Tommy John surgery. If you want to see the Twins take the field in style, a Target Field luxury suite will provide you with just that. Renting a suite for a Twins game is the best way to entertain clients, employees or enjoy a day at the yard with friends and family. Twins suites will comfortably hold 16 – 30 guests and allow for plenty of entertaining space within the suite. With VIP parking, private entry and premium in-suite catering options, experience what the suite life is all about. The Minnesota Twins made history in 2017 when they became the first team in MLB history to make the postseason just one year after losing 100+ games. The Twins lost in the AL Wild Card Game, but it was still a season far better than perhaps even the Twins themselves could have ever dreamed of. They will look to build on last year’s magical season and carry that success over to 2018. Veteran Joe Mauer will enter his 15th season, all of which have come with Minnesota. Despite not producing the type of power scouts once thought he could, Mauer still gets on base at an excellent rate and rarely strikes out. If Brian Dozier hits at least 28 home runs in 2018, it will be his fourth consecutive year reaching that clip. The Twins second baseman has emerged as a lethal power threat in the middle of the lineup along with 2017 All-Star Miguel Sano. Sano is one of the most exciting young players in all of baseball, bringing electricity and power to the Twins lineup. In the outfield, Eddie Rosario, Byron Buxton, and Max Kepler all played key roles in last year’s march to the postseason. Together they form one of the youngest and most entertaining outfields in the American League. The starting rotation still has plenty of question marks, but there is room for improvement in 2018. Ervin Santana was phenomenal all of last season - it will be essential for him to replicate last year’s success in 2018. Behind Santana, 23-year old Jose Berrios will look to build on a strong 2017 campaign, while improvement is needed from Kyle Gibson, Adalberto Mejia, and Phil Hughes. If Minnesota picks up a key arm during the season, watch out for the Twins. Private suites at Target Field provide the perfect setting for business or for pleasure. On the Target Field Club Level, you can rent out Event Suites for groups of 24 – 30 guests. With a Twins suite, you will receive VIP parking passes, private entry into Target Field, a suite attendant to help on gameday and premium in-suite catering options. 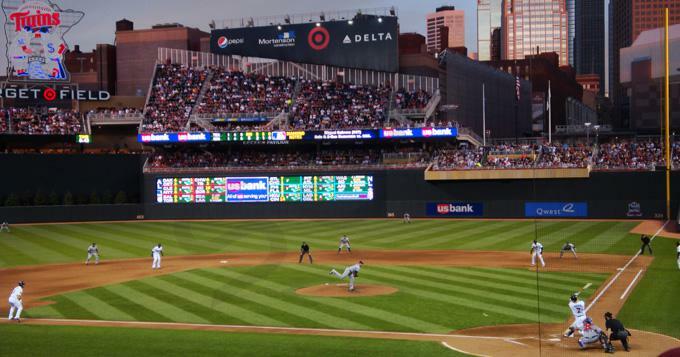 Luxury box prices for Twins games will vary on a game-by-game basis. Private suites at Target Field provide the perfect setting for business or for pleasure. On the Target Field Club Level, you can rent out Event Suites for groups of 24 – 30 guests. With a Twins suite, you will receive VIP parking passes, private entry into Target Field, a suite attendant to help on gameday and premium in-suite catering options. Suite prices for Twins games will vary on a game-by-game basis. The 2017 Minnesota Twins could take a huge step forward in the American League Central. The Twins have a handful of young prospects who will be given an opportunity to succeed out of the gate. These players include Miguel Sano, Byron Buxton and Max Kepler. Offensively, Brian Dozier is the bright spot in the lineup. Dozier set an American League record in 2016 with 42 home runs by a second baseman. While Sano didn’t live up to expectations last year, he’s getting another shot and has huge home run potential. Kepler as a rookie hit 17 home runs last season. Buxton is the player Twins fans have been waiting to break out. If Buxton can put it all together this year, the Twins will have a new leadoff man. Joe Mauer is still one of the game’s best contact hitters and is a leader on this team. As far as the rest of the lineup, manager Paul Molitor will mix things up with Kennys Vargas, Eddie Rosario, Jason Castro, Byung ho Park and Jorge Polanco. The pitching staff will look to improve in 2017. The bullpen will be anchored by new closer Brandon Kintzler who took over after Glen Perkins went down with an injury last season. The rotation will feature Ervin Santana, Hector Santiago, Kyle Gibson, Phil Hughes, Tyler Duffey and Jose Berrios. The Twins are expecting Berrios to take a big leap forward after his first opportunity in the big leagues last year. Waiting in the minors is Adalberto Mejia. The Minnesota Twins surprised a lot of people in baseball last year by finishing second in the AL Central. In 2016, the Twins will have a tougher time surprising teams as their opponents are well aware of what’s happening at Target Field. Fans of the Twins can’t wait to see what rookie Byron Buxton will bring to the table in 2016. Buxton is one of baseball’s top prospects but struggled in his first taste in the big leagues. Buxton will still be a rookie this year and will be the Twins’ centerfielder. Miguel Sano also was called up from the minors last years and had no problems showing his big power with big league pitching. Sano is a player who has 40 home run potential. Sano will mostly play DH and outfield this year. The other top prospect from a year ago was catcher and outfielder, Eddie Rosario. Rosario drove in 15 home runs in his rookie campaign. Their biggest acquisition of the offseason was the signing of Byung-ho Park. Park was a star in the Korean Baseball Organization. Brian Dozier continued to hit more home run than any other second baseman in baseball. While you don’t see much power from Joe Mauer these days, Mauer is still considered one of baseball’s best contact hitters. Trevor Plouffe will handle third base duties. Offense shouldn’t be an issue for manager Paul Molitor. Pitching is where the Twins don’t have as much depth. The starting rotation will be Ervin Santana, Phil Hughes, Kyle Gibson, Ricky Nolasco and Tommy Milone. The bullpen will feature closer, Glen Perkins. A Minnesota Twins luxury suite at Target Field offers a wonderful climate-controlled environment for your clients, family, friends, and employees. A Twins suite will include VIP parking passes, private entry into the stadium, exclusive access to stadium clubs, premium in-catering options, HDTV’s and a dedicated suite attendant. Luxury boxes for the Twins can accommodate small or large groups. The Minnesota Twins should be able to improve in 2015 after finishing last in the American League Central last season. The Twins organization made a major change this offseason to help turn the Twins around. They hired a new Manager, Paul Molitor to replace Ron Gardenhire. Molitor is a former Twins’ star and in the Hall of Fame. Speaking of former Twins stars, the team also brought back fan favorite Torii Hunter to play outfield. Joe Mauer will play his second full season at first base. The Twins will need a healthy Mauer if they plan to surprise the AL Central. The Twins feature a lot of young talent who will be core players in the Twins future. Danny Santana was one of the Twins best players last season and he was just rookie. Kennys Vargas is expected to be the club’s everyday designated hitter. Oswaldo Arcia hit 20 home runs in just 103 games. On top of these young stars, the Twins feature some of the best prospects in the minors who can make their debut in 2015 such as Byron Buxton, Miguel Sano and Alex Meyer. The Twins added to their pitching rotation by signing Ervin Santana. He’ll join Ricky Nolasco and Phil Hughes. Thank you for signing up for specials at Target Field. Enter your email address below to stay in touch. We'll sign you up for our newsletter, which will inform you of the latest inventory and events at Target Field. We promise we will never sell or distribute your information. The seating chart below shows where the Minnesota Twins suites at Target Field are located.